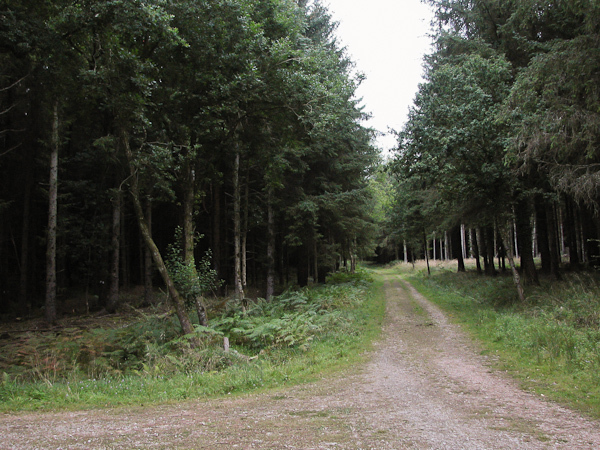 As summer ends and the autumnal equinox approaches, the monthly recording sessions in Haldon Forest are becoming more challenging. For the last few months there’s been a golden hour between 4am and 5am, with enough light for the wildlife to be active and very little traffic on the roads. Now darkness lasts until 6am, by which time plenty of people are up and about, and the lay-by I’ve been using previously has cars going past every few minutes. With this in mind I thought I’d try something different for the September recording. Rather than relaxing in a car seat and listening to my AT4022 boundary array remotely, I thought I’d head out into the forest on foot and see what I could find. To keep the weight down I took my LS-10 recorder and a pair of MiniPIP microphones in a Rycote windshield. At 5am it was still pitch dark as I parked the car at the head of one of the trails leading into the plantations. I always find the first few minutes of walking out into woodland at night quite intimidating – even though intellectually I know there’s unlikely to be any dangerous creatures roaming around, the inky blackness under the trees affects the more primitive parts of the brain that don’t always listen to reason. Within a few minutes the apprehension wears off and your senses begin to tune into all the subtle signs of life going on all around. There are Fallow Deer everywhere in the forest, and at regular intervals my headtorch beam would pick out their reflective eyes watching me from either side of the trail. After a while I began to realise that I could smell the deer, often before I saw them – possibly as the rutting season approaches the males develop a more pungent odour? It’s an interesting reversal of the classic stalking concept of remaining downwind from the deer so they don’t smell you! As far as sound recordings went it was a pretty unrewarding morning. Even in the heart of the forest you can’t get more than 2km from a road, and in the still air the sound of a vehicle can easily carry that far. Mix that in with the occasional airliner passing overhead and you get pretty much continuous disturbance. Also we’re in a slack period where most of the breeding and summer migrant birds have departed, but the wintering species like Redwing and Fieldfare haven’t arrived yet, meaning there’s very little bird activity. The crackle and hum of the high-voltage power line which runs north-south through the forest. I debated whether to include this since it’s certainly� not a natural sound, but the power line has a significant effect on the ecology of the forest (the easement is managed as a butterfly habitat for species including Pearl-bordered Fritillary) so I left it in. Tawny Owls (and a single Common Toad) calling around the pond in Kiddens Plantation. One Response to "Walking in the Woods"
It’s interesting that making a recording during a slack period for bird activity draws attention to other aspects of the forest. It hadn’t occurred to me that a power line might serve as useful wildlife habitat, and I’m jealous that you got to smell the deer!